Give us a call on 03 9789 9779, our staff will promptly fit you in and accommodate needs in emergency situations. Pain relief is just a phone call away. Your health and wellbeing is of the highest priority to our caring professionals. At our dental practice in Frankston everyone, from children to adults, will receive the treatment they need in a timely manner at prices you can afford. As a local clinic, we have been treating the dental and oral hygiene needs of Karingal Drive for over 15 years. Utilising the latest techniques and technologies, we are one of the most well equipped clinics in the area. We are happy to discuss your needs and provide more information about our services and treatments. 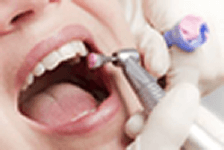 As an experienced dentist and family dentist we specialise in treating patients who are scared or afraid of dentistry. We also treat patients under Victorian Emergency Dental Scheme (VEDS), Victorian General Dental Scheme (VGDS) and Victorian Denture Scheme (VDS). Fillings are the most common type of ‘restorative treatment’. A filling replaces the part of the tooth that has been lost because of decay or has been fractured or broken. Depending on the size and location of the defect, an anaesthetic may not be needed to place a filling. It is normally recommended that you visit your dentist twice a year, however in some cases as with patients who have severe gum disease, you may be advised to come more often. Even with regular brushing and flossing, there will be areas which are not accessible and a build-up of calculus or tarter is quite common. Some people get more build up than others. This needs to be removed periodically and the dentist will use a special ultrasonic machine which vibrates gently to remove this build up. This helps maintain the health of your teeth and gums. We will also polish the teeth to remove any stains. You will also get some high concentrate fluoride to help make your teeth more resistant to decay. It is recommended that you don’t drink or eat anything for half an hour to allow the fluoride to work. In some cases, if the decay is deep and has infected the nerve, a root canal treatment may be needed before a filling can be placed. This is often needed if there is an abscess. Over several appointments, your dentist will clean out the nerve and place a medication inside the tooth to help remove the pain. Then the canals will be filled a filling can be placed. 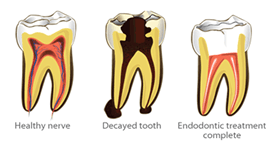 In the cases of heavily broken down teeth, a simple filling may not last very long and a crown may be suggested. 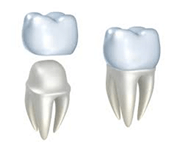 A crown is a cap over the tooth to help protect it from breaking any further. A crown may be gold or tooth coloured. Your dentist will suggest what is most appropriate for you. We adjust your existing dentures to make it comfortable for you. Dentures are removable plates which can be used to replace missing teeth. They are custom made in a lab to suit your individual teeth and gums. Dentures can be completely acrylic or may have some metal. Partial dentures replace some teeth, while full dentures replace all the teeth. Click Here to find out more information about Emergency Care. Whether in everyday life or at a special occasion you want to be able to proudly show off your smile without a second thought. At Karingal Drive Dental Clinic, we believe in providing immediate care and want you to feel comfortable in visiting our dental practice whenever a dental problem occurs. As a family owned and run practice, based in Frankston, we treat our clients with the compassion and sensitivity they deserve, offering tailored solutions for every individual circumstance. Dr Ravi K Kamisetty and our experienced dentistry team is fully qualified and trained to perform a number of treatments and can help you with all your dental needs. As we also offer emergency appointments, pain relief is just a phone call away. Treatment to Leave You Smiling! Delivering dental services to Frankston residents and beyond, the team at Karingal Drive Dental Clinic are passionate about improving the quality of your teeth. Our highly trained and experienced team know that correct dental care is integral to your health and wellbeing. Our professional’s highest priority is to deliver outstanding and comprehensive dental services. At our dental practice in Frankston everyone, from children to adults, will receive the treatment they need in a timely manner at prices you can afford. As a local clinic, Karingal Drive Dental’s team of skilled dentists have been treating the dental and oral hygiene needs of Karingal Drive residents for over 15 years. Utilising the latest techniques and technologies, we are one of the most well equipped clinics in the area. We are happy to discuss your needs and provide more information about our services and treatments. As a family-friendly clinic, we aim to provide affordable dental solutions to Frankston patients and residents from surrounding suburbs. As an experienced family dentist, we specialise in treating patients who are anxious about undergoing dental treatment. Our skilled and highly-trained dentists deliver a personalised and attentive level of care to help ease the concerns of our patients. A specialist orthodontist will also be available to assess and treat all types of orthodontic problems. Orthodontics and dentofacial orthopedics, is a specialty field of dentistry. An orthodontist is a specialist who has undergone 3 extra years of special training in a dental school after they have graduated in dentistry. The specialty deals primarily with the diagnosis, prevention and correction of malpositioned teeth and the jaws. Trained in inspecting, repairing, and treating developing teeth our team are fully able to manage your child’s teeth. Frankston parents and guardians can call our clinic today to find out more about how we can correct and adjust teeth of all shapes and sizes. But orthodontics can be for adults too and all options can be discussed. Are you wanting to enhance the visual appeal of your teeth? Do you feel as though your teeth need a thorough whitening? As skilled and attentive dentists, the team at Karingal Drive Dental Clinic can make your smile wider and brighter with a few additions and adjustments. By utilising the best in cosmetic dentistry advances our Frankston-based experts can provide several high-quality services including teeth whitening, dental implants, veneers, crowns, and teeth straightening methods among other solutions. To learn more about our dental clinic’s services Frankston patients can call us today. Committed to providing the best level of service to all our clients Karingal Drive Dental Clinic aims to deliver outstanding dental services to as many patients as possible. Thanks to this aim we treat patients under Victorian Emergency Dental Scheme (VEDS), Victorian General Dental Scheme (VGDS) and Victorian Denture Scheme (VDS). For unmatched and personalised dental services Frankston and surrounding residents can contact the helpful staff at our Karingal Drive Dental Clinic today.